50% of rental charged to your card to confirm reservation. Balance due 30 days before arrival. This applies to any additional services requested. Balance will be automatically charged 30 days prior to arrival. If you prefer a different payment method notify us prior to 30 days before arrival. By booking online guest agrees they have read the full policy statement. You may cancel your reservation prior to 30 days arrival with a $50.00 cancellation fee. Within 30 days of arrival all room sales are final. You may reschedule your stay to a different date. Cancellations are accepted by email only and must be confirmed by Can U Canoe Riverview Cabins. Inclement Weather – No refund – Credit issued for future stay. We do not issue refunds for inclement weather. If the weather including snow and ice cause travel to be impossible we will notify you in advance. A credit is issued for a stay in the future. Should the weather not allow departure the charges on the cabin will be the same daily rate with any applicable discounts. Pets not registered will be charged 150.00 pet fee. All cancellations made by email only. All changes in reservation dates made my email only. The following policies have been designed to provide a clean and comfortable lodging experience for all our guests. Reservations made online are with the agreement you have read the entire policy statement. Check in starts at 3PM. We allow our guest to check in at any time that is convenient for them. Your first day of vacation should not be about a time schedule. Check out is no later than11AM. Please call guest services @ 479-253-5966 by 10AM to arrange check out inspection prior to 11AM departure. Smoking is permitted OUTSIDE the cabins. Please use the ash cans provided. Please do not throw butts on the ground. NO SMOKING IS PERMITTED INSIDE THE CABINS! Included in your rental is a Property Damage Protection charge of $39.00, non refundable. Although you remain responsible for the care and condition of the vacation rental property, Property Damage Protection provides you with protection against unintentional damage without the need to tie up your money with a large security deposit. When you agree to rent the property, you are agreeing to accept of the Property Damage Protection and the terms and conditions which apply to the plan. We appreciate the majority of our guest have registered all of the guest in the cabins. Having guest that are not registered will cause additional charges or may result in the termination of your reservation without refund. This applies to guest staying in the cabins overnight or day visits only. For events please see event policy below. Pets - We are Pet Lovers! We are a family friendly lodging and pets are part of the family. Pets must be approved in advance. Pet fee starts at 75.00 – Determined by number of pets and size. For the safety of your pet please keep them on a leash during walks. We ask for pets to be crated in the absence of their humans to avoid damage to the cabins. The views from Can U Canoe of Inspiration Valley 400 feet below are inspiring and inviting. Please feel free to explore all Can U Canoe has to offer. Please refrain from going onto the decks of the other cabins. Guest with children please instruct your youngsters while they are exploring Can U Canoe to respect the privacy of other cabin dwellers. We do offer homes for large parties and they are secluded away from the mainstream of the other cabins. 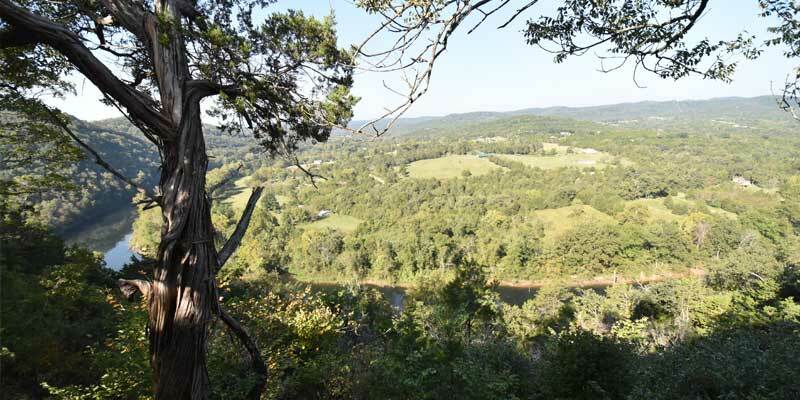 One of the most enjoyed benefits of our cabins is the peace and serenity of being on the bluff. Loud music and parties are limited to the cabins that will not interfere with others being able to enjoy the quiet beauty of nature. Fireplace season is October 1 to March 31. Please feel free to enjoy the fireplace during this time. We provide a bundle of wood as part of your rental. Our wood is not the type you buy at a local retail store. These are locally cut and seasoned logs. One bundle is 30 to 35 logs and will provide ample fireplace enjoyment. If additional wood is needed please phone the office for delivery and cost. 24 Hour Notice is requested. Weddings, family reunions, receptions, corporate retreats and more are welcome. Please contact us for information on these rentals. The most asked question, what do we do at check out? Please phone us 479 253 5966 and let us know about your departure by 10AM. If you are leaving earlier we appreciate if you are able to let us know. BEDDING – Please “do not” strip the beds. TOWELS – Please leave near laundry area. WASTE – Please put all waste in appropriate containers. DAMAGE – If there has been any damage give us a call and we will come down and visit with you. Guest want to know what our “policies are”. Our policy is to provide an environment that ensures you will experience all that Can U Canoe Cabins hopes you will enjoy during your stay with us.